Deep convection has once again built near the low center of Philippe, although most reamains to the south. 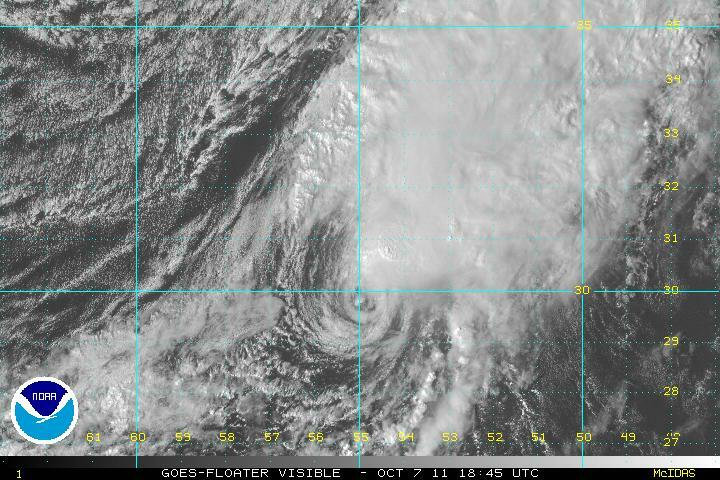 Philippe continues to go through the yo-yo cycle of weakening and strengthening as a tropical storm. It still remains no threat to land. At 5 pm edt / ast Philippe was centered at 26.3 N / 52.9 W or about 825 miles ese of Bermuda. Top sustained winds are estimated at 50 mph (NHC 50 mph earlier advisory). Movement: wnw 12 mph. Pressure estimated at 993 mb. Forecasts take Philippe wnw then west into tomorrow. Models then turn Philippe wsw and stall it north of Puerto Rico by about 300 miles into the middle of this week. It then is forecast to move northeast back into the Atlantic late this week. Nothing new to report, Philippe is sheared still. The northwest side of the storm is exposed by the upper level winds. Deep convection remains on the southeast side of Philippe. At 7 am edt / ast Philippe was centered at 25.8 N / 55.0 W or about 740 miles se of Bermuda. Top sustained winds are estimated at 50 mph (NHC 50 mph earlier advisory). Movement: west 12 mph. Pressure estimated at 1004 mb. 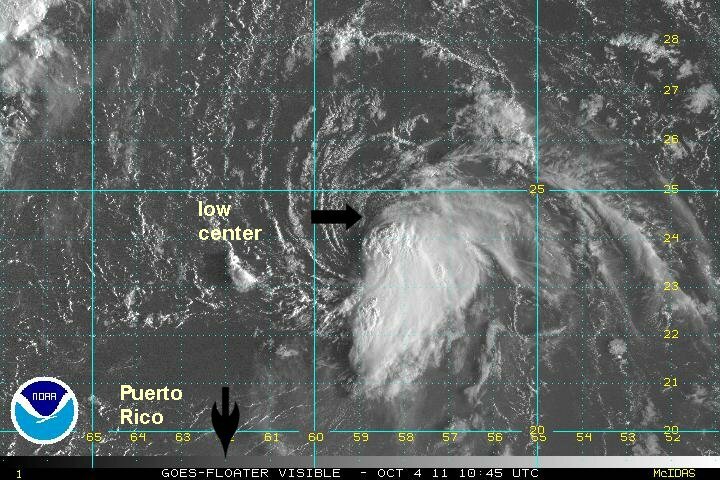 Forecasts take Philippe west today and slow Philippe north of Puerto Rico by about 500 miles into tomorrow. It is forecast to move northeast back into the open Atlantic Wednesday and continue late this week. The hurricane center had a difficult time with strength estimates at the last advisory. 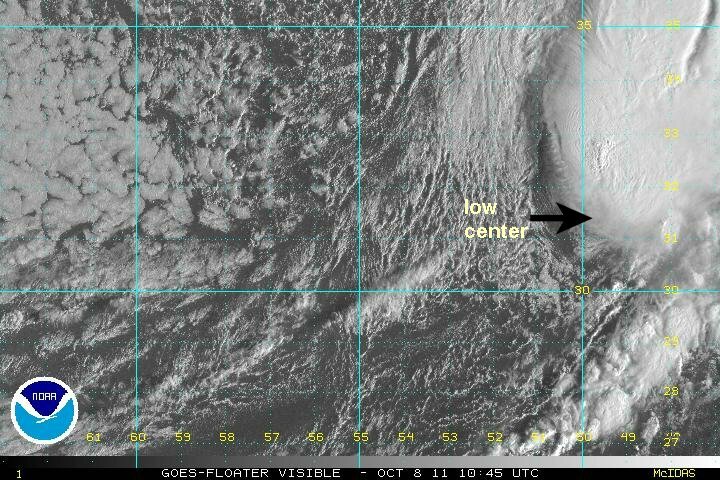 They noted an "eyelike" feature about five hours ago when convection started to wrap around the low center. 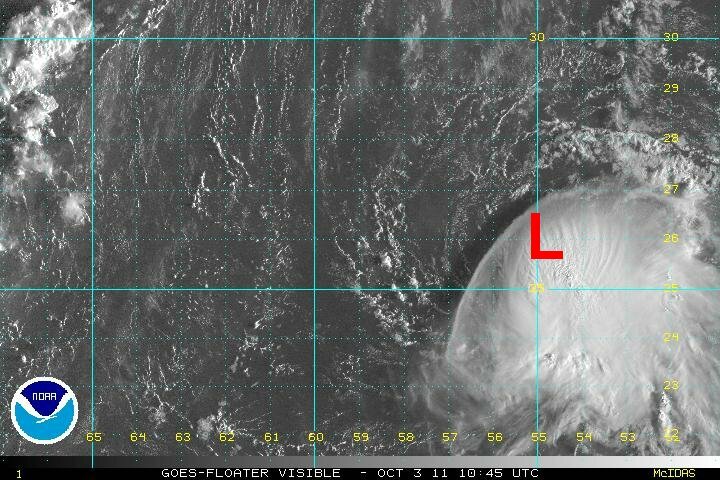 The satellite wind estimate was lower than the previous hurricane center estimate. They took the middle road and went with 65 mph. Since then, windshear has destroyed the eyelike feature. My estimate is probably generous with 50 mph with convection only on the south side of the system. At 8 am edt / ast Philippe was centered at 23.6 N / 58.5 W or about 700 miles se of Bermuda. Top sustained winds are estimated at 50 mph (NHC 65 mph earlier advisory). Movement: west 10 mph. Pressure estimated at 997 mb. Forecasts take Philippe west today and recurve Philippe north of Puerto Rico by about 500 miles into tomorrow. It is forecast to move northeast back into the open Atlantic Wednesday and continue late this week. It's possible that Philippe may briefly become a hurricane over the next 24-48 hours if windshear relaxes enough. Deep convection has built up a little more impressively today. Although the northerly shear continues, There may be a short window of opportunity soon for Philippe to become a hurricane if the wind shear weakens sufficiently. 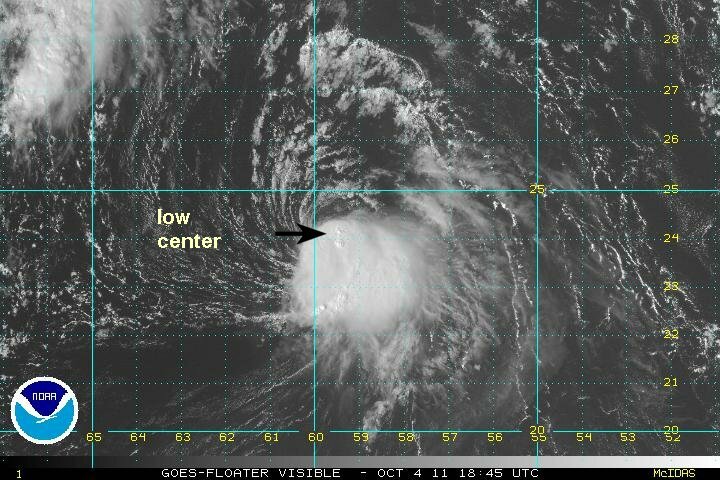 At 4 pm edt / ast Philippe was centered at 24.0 N / 59.6 W or about 655 miles se of Bermuda. Top sustained winds are estimated at 60 mph (NHC 65 mph earlier advisory). Movement: west 10 mph. Pressure estimated at 997 mb. Philippe is slowing and starting to turn. The northerly shear is shifting to westerly wind shear, so the western side of the circulation is starting to get exposed. Philippe still may have a window of opportunity to become a hurricane druing the next 24-36 hours before wind shear is expected to increase again. Now that visible satellite images are available a more accurate placement of the position is possible. 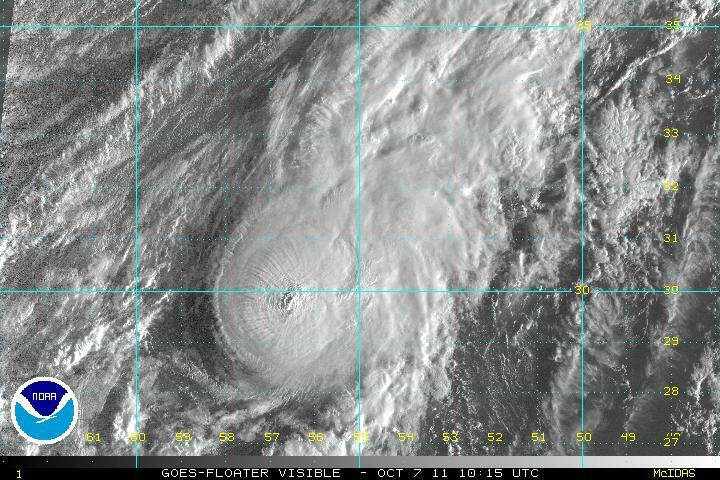 At 8 am edt / ast Philippe was centered at 25.0 N / 60.9 W or about 555 miles sse of Bermuda. Top sustained winds are estimated at 60 mph (NHC 65 mph earlier advisory). Movement: wnw 6 mph. Pressure estimated at 997 mb. Forecasts slow Philippe today and recurve it northeast during the next 24 hours. It will move into the open Atlantic Wednesday and continue late this week. It's possible that Philippe may briefly become a hurricane over the next 12-36 hours if windshear relaxes enough. Philippe is turning north this evening. Windshear is relaxing a little and Philippe could possibly be a minimal hurricane if the shear continues to drop. It continues to be no threat to land. At 5 pm edt / ast Philippe was centered at 25.8 N / 61.3 W or about 495 miles sse of Bermuda. Top sustained winds are estimated at 65 mph (NHC 65 mph earlier advisory). Movement: north at 7 mph. Pressure estimated at 997 mb. Philippe is recurving north this evening. It will turn more northeast later tonight and into the open Atlantic Thursday and continue later this weekend. It's possible that Philippe may briefly become a hurricane over the next 6-36 hours if windshear relaxes enough. Philippe is gradually organizing and should become a minimal hurricane later today. 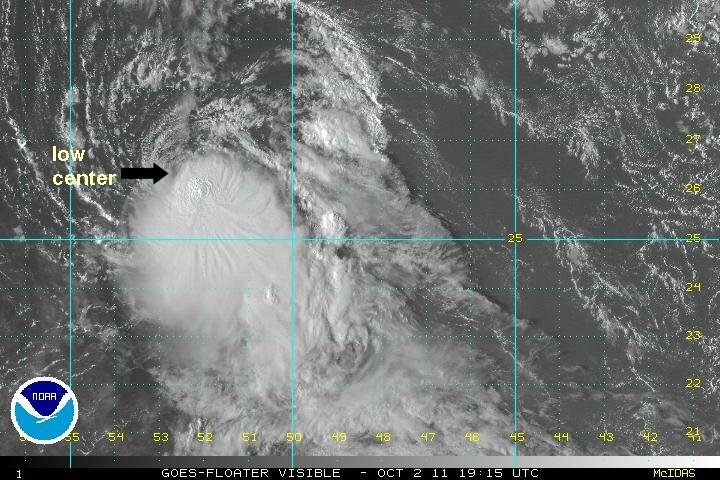 As expected, wind shear has decreased which has allowed Philippe to gain some strength. Philippe continues to turn and I'm estimating a ne direction instead of nne that NHC is estimating. It continues to be no threat to land. 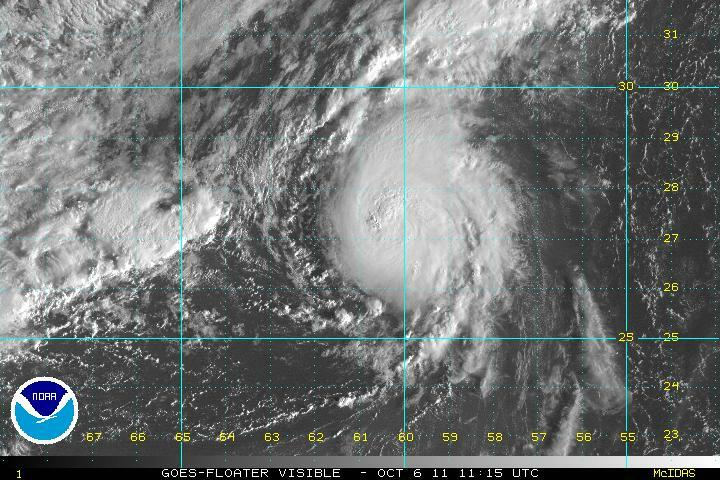 At 7 am edt / ast Philippe was centered at 27.0 N / 60.4 W or about 450 miles se of Bermuda. Top sustained winds are estimated at 70 mph (NHC 70 mph earlier advisory). Movement: ne at 8 mph. Pressure estimated at 991 mb. Philippe is still turning and should be heading northeast later today. It is comfortably away from Bermuda. 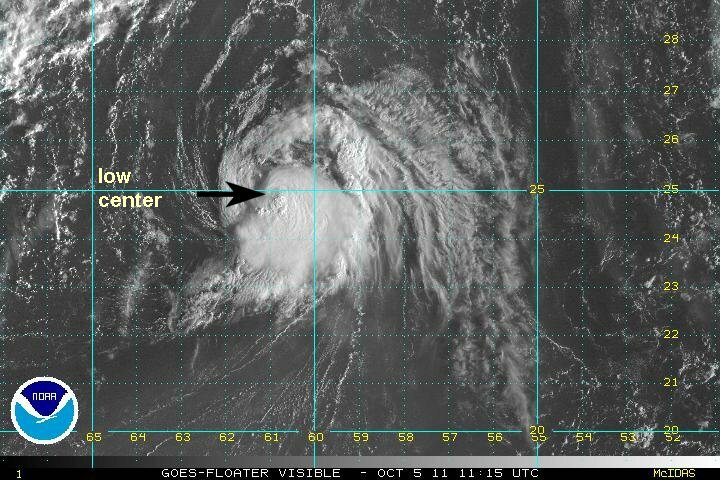 It will progress into the middle of the open north Atlantic losing tropical properties during the next couple of days. The wind shear has relaxed as the models have predicted. With the wind shear dropping Philippe continues to strengthen. 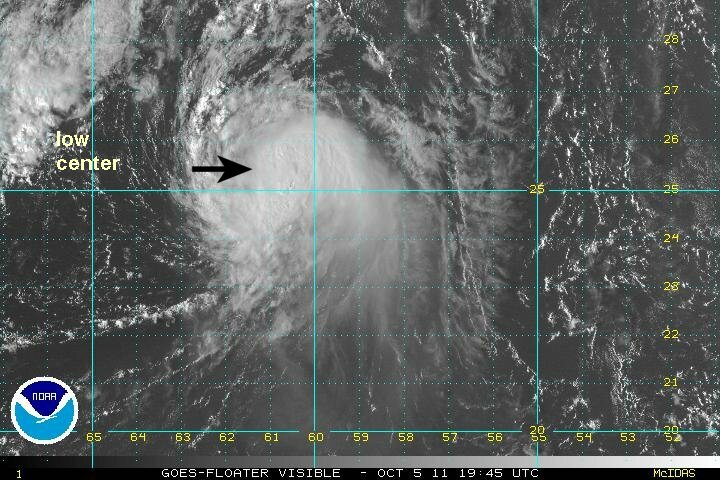 At 5 pm edt / ast Philippe was centered at 28.7 N / 59.0 W or about 425 miles se of Bermuda. Top sustained winds are estimated at 90 mph (NHC 85 mph earlier advisory). Movement: ne at 13mph. Pressure estimated at 980 mb. Philippe will progress into the middle of the open north Atlantic losing tropical properties during the next couple of days. Philippe probably has maxed out. Satellite imagery shows some wind shear on the west side of the circulation. Philippe should turn more northeast and lose its tropical characteristics over the next few days. I'm estimating Philippe slightly weaker than NHC as shear has began. At 7 am edt / ast Philippe was centered at 29.7 N / 56.1 W or about 500 miles ese of Bermuda. Top sustained winds are estimated at 80 mph (NHC 90 mph earlier advisory). Movement: ne at 17 mph. Pressure estimated at 978 mb. Philippe is centered on the bottom portion of the cloud mass in the picture below. It is still being sheared and is also losing its tropical characteristics. A cold front has caught up to Philippe which will help transform the warm core circulation. Philippe is not a threat to land. 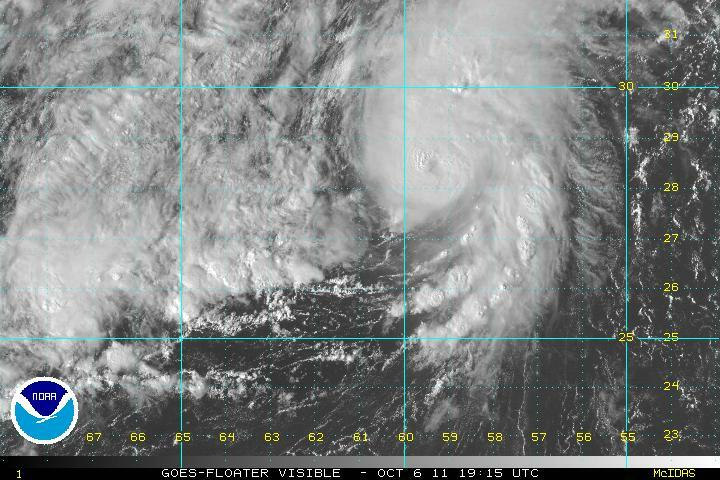 At 8 am edt / ast Philippe was centered at 31.3 N / 49.5 W or about 860 miles east of Bermuda. Top sustained winds are estimated at 55 mph (NHC 60 mph earlier advisory). Movement: ene at 24 mph. Pressure estimated at 989 mb. Philippe will progress into the middle of the open north Atlantic losing tropical properties during the next 24 hours. This will be the last update on Philippe.